Empty bullet box, each box holds 20 one oz 45 ACP bullets. These official boxes are direct from the mint and come complete with lids. Organize your stack and make it easy to store. This is the newer-style box for NTR bullets, and will come with a foam insert for holding the bullets. 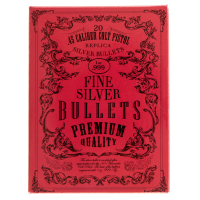 Empty Bullet Box | Red Empty bullet box, each box holds 20 one oz 45 ACP bullets. These official boxes are direct from the mint and come complete with lids. Organize your stack and make it easy to store. This is the newer-style box for NTR bullets, and will come with a foam insert for holding the bullets. Perfect for storing your investment!